2019-March 29 — Summer Theatre Camp – Everybody Acts has selected The Rainbow Fish Musical as the camp show. Click HERE for more details. 2019-March 4 — The Fox on the Fairway is cast! The cast is announced and it includes both new faces at KMP as well as some familiar faces. Click HERE to find out who made it. 2019-January 24 — Audition Announcement- There will be auditions for The Fox on the Fairway on February 21st and 23rd. The show begins rehearsal March 11th and runs 9 performances May 3rd to 12th. It will be directed by Al Wallisch. Click HERE for details. 2019-January 14 — Deja Vu, Again! is cast. The cast is announced and it includes both new faces at KMP as well as some familiar faces. Click HERE to find out who made it. 2018-May 27 — Save the KMP Bees! Yes, we have a bit of an issue with an estimated 50-100,000 honey bees living in the outer wall and under the roof of the theater. You can help to save them! Just follow the link HERE and donate today! 2018-March 26 — Saturday matinees have been moved from 4:00pm to 3:00pm to allow for more time between the matinee and evening performance. 2018-February 4 — Auditions scheduled for Arsenic and Old Lace on Thursday, February 15th and Saturday, February 17th. Details on the AUDITIONS PAGE. 2018-January 29 — Tickets for “…in the time of old age.“ are now on sale. 2018-January 8 — Tickets for Steel Magnolias are now on sale. 2018-January 2 — Tickets for Pat McCurdy are just $26 and go on sale TODAY! 2017-November 27 — Auditions for “…in the time of old age“ are scheduled for December 5th and 11th at 7:00pm. The comedy will be directed by John Brandl. 2017-October 30 — Tickets for The Gifts of the Magi, the Musical are now on sale. Begin your purchase HERE. 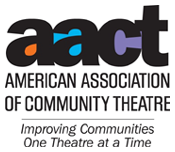 SAT, NOV 4, 4:30PM – 58 – ADDED PERFORMANCE! 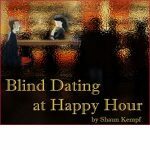 2017-October 26 — To meet increasing demand a performance was added for Blind Dating at Happy Hour. SAT, NOV 4, 4:30PM – 64 – ADDED PERFORMANCE! 2017-October 23 — The November 11th audition for Steel Magnolias has been moved from 1:00pm to 10:00am. 2017-October 16 — The time has come! 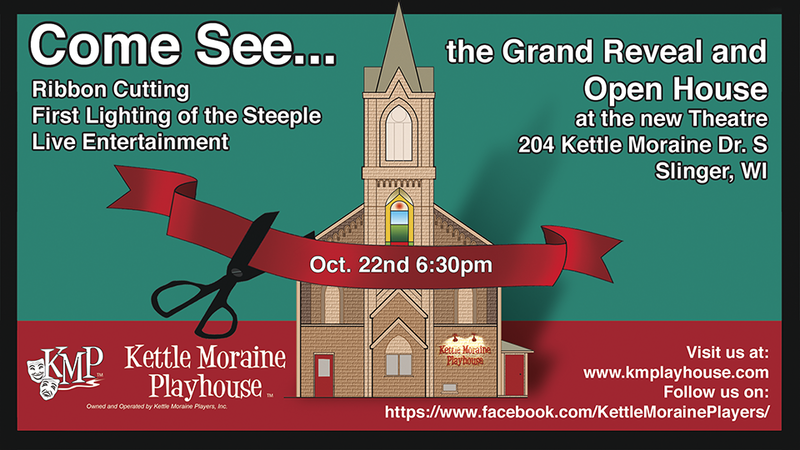 At 6:30pm on Sunday, October 22nd we will assemble to cut the ribbon and light the steeple for the first time ever. There will be an open house with live music and it’s free except for the cash bar. Come see what we have done! 2017-October 15 — Tickets for Blind Dating at Happy Hour went on sale on the website on Thursday, October 12th! Details are on the INDIVIDUAL SHOW TICKETS PAGE. They are selling at a phenomenal rate. In just 4 days 26% of the seats have been sold and the advertising doesn’t start until Tuesday. All individual show tickets are sold exclusively on the website. The only time you need to call the box office is if your party includes persons in wheel chairs or who use a walker or if you are booking a group of 10 or more. All other sales are exclusively via the website. 2017-October 8 — Tickets for Blind Dating at Happy Hour will go on sale on the website on Thursday, October 12th! Details are on the INDIVIDUAL SHOW TICKETS PAGE. With only 64 seats for each performance, it would be a good idea to purchase early. All the seats are good seats with no one more than 20 feet from the stage, but season ticket holders have already scooped up a bunch and more season ticket orders are coming in each day. Individual show tickets for the other shows will go on sale approximately 7 weeks before the opening date. The cast has really gotten into this show and it is FUNNY, FUNNY, FUNNY! 2017-October 2 — The final inspection for our occupancy permit will be next week. Many hands are needed now to finish our preparations. See the event calendar in the lower left area of every page for details. 2017-September 24 — The cast list for The Gifts of the Magi, A Musical is out. Included are- Phillip Steenbekkers (Slinger), Jim Werwinski (Hartford), Lindsey VanderWielen (West Bend), Al Wallisch (Waupun), Robb Bessey (Hartford), Michelle Baranski (Hartford) and Jovon Serrano (Jackson). The show is directed by Sally Jude with music direction by Stephanie Funk. Details are on the AUDITIONS PAGE. 2017-August 16 — Auditions have been scheduled for November 6th at 7:00pm and November 11th at 1:00pm for Robert Harling’s classic Steel Magnolias. The show will begin rehearsals December 11 but have just 3 rehearsals before Christmas and none in the 10 days leading up to Christmas. The other piece of good news for the ladies is there will not be a rehearsal on Valentines Day. There will be 8 performances from February 9th to 18th, 2018. The play will be directed by Lyle Krueger. Details are on the AUDITIONS PAGE. 2017-August 14 — Work sessions for August 15th through August 20th have been scheduled. There are 8 of them in the 6 day period! Why so many? We have about 3 weeks to make catwalks, a stage, grandstands and paint over 3000 square feet. We are determined to open on time! Get the details on the WORK SESSIONS PAGE. 2017-August 7 — The cast for Blind Dating at Happy Hour has been determined. Check the list on the AUDITIONS PAGE. 2017-August 4 — There will be a reading of The Gifts of the Magi, A Musical on September 7th at 7:00pm and the auditions have been scheduled for September 19th and September 21st, both at 7:00pm. This delightful little musical is based on the famous O. Henry story of a young couple trying to make their way in New York City. The show features an ensemble cast of 6 and a “street chorus” of 8 high school students will be added to it. Interested high school students should contact the Business Manager at BusinessManager@KMPlayhouse.com. Details are on the AUDITIONS PAGE. 2017-July 16 — The first Playhouse Auditions have been scheduled for the first production, Blind Dating at Happy Hour by local playwright Shaun Kempf. Shaun will also direct this very funny comedy. Actors who attended the reading spent a lot of time laughing and gave the script a resounding thumbs up. Don’t miss the chance to be part of a show that is a proven crowd pleaser. Auditions are on August 2nd and 3rd. Details are on the AUDITIONS PAGE. 2017-July 15 — Work Sessions have been scheduled for Monday, July 17th, Tuesday, July 18th and Thursday, July 20th at 6:00pm as well as Saturday, July 22nd at 9:00am. We need someone to clean up the work site sawdust as well as handymen and carpenters. Details on the WORK SESSIONS PAGE. 2017-July 3 — We have had small but highly effective groups of volunteers the past two Sa turdays who got a lot of work done. Just 8 weeks from tonight is the first rehearsal! This week the pace escalates as we have sessions on Wednesday, July 5th and Thursday, July 6th from 6:00pm to 9:00pm and Saturday, July 8th from 9:00am to 3:00pm. A decision about whether there will be a work session on Sunday will be made Thursday evening. The work this week is pretty much all general carpentry but it would also be good to have someone to clean up behind them as they will be making a lot of sawdust. More information is always available on the WORK SESSIONS PAGE and if you have questions, check the calendar [at the bottom of every page of this site] for who to contact. 2017-June 19 — The work starts NOW! In just 9 weeks, on August 28th, the first rehearsal for Blind Dating at Happy Hour will be happening at the Playhouse. 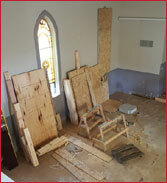 That means, with the help of Keller Construction, we have just 9 weeks to change a church into a theater. We are doing almost all the interior work ourselves and we need lots of help. The work sessions begin Saturday, June 24th at 9:00am at the Playhouse so put on your working clothes and come join the fun. More information is available on the WORK SESSIONS PAGE and if you have questions, check the calendar [at the bottom of every page of this site] for who to contact. And here’s a tip about Saturday the 24th, FREE CARPET! 2017-May 14 — Last night’s party at Little Switzerland was a great success! About 75 people enjoyed some food and cocktails, met board members, browsed blueprints, literature and learned more about the Playhouse and our plans for it. Many tested out the seats that will be installed and gave them high reviews. As the evening wore on actors tried their hands at some readings from the 5 shows much to the delight of everyone. There was also a wonderful video created by our tech department that gave those who had never been in the church a 2 minute electronic tour. To those who came, thank you very much. Those who were unable to attend can check out the video HERE. 2017-April 23 — KMP announced a 2017-2018 Season Kick-Off Event. 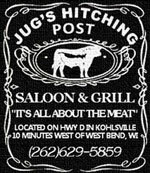 The event is open to the public and will be held from 7:00pm to 11:00pm on Saturday, May 13th in the Chalet at Little Switzerland in Slinger. There will be free appetizers, a cash bar and music. Attendees can see blueprints for the new Playhouse, sit in one of the new theatre seats the Playhouse will have and learn how they can volunteer as well as all the details of how they can support the Playhouse financially. All of the board members and management team will be available to answer any questions. The 5 shows of the 2017-2018 season will be announced and all 5 directors will be available to answer questions actors may have. Actors may choose to participate in short readings to please the crowd and impress the director. Actors may also sign up to participate in complete script readings which will be scheduled at a later date. Attendees can also sign up for email notifications of events and activities.